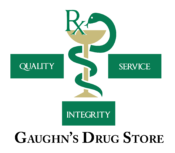 Our pharmacy’s goal is to be the primary supplier of health care products and services to our community. We treat our patients with respect and dignity. We are caring neighbors, involved in community activities in meaningful ways and committed to reflecting the diversity of our neighborhood. We are committed to providing the highest level of quality service within every aspect of our business. 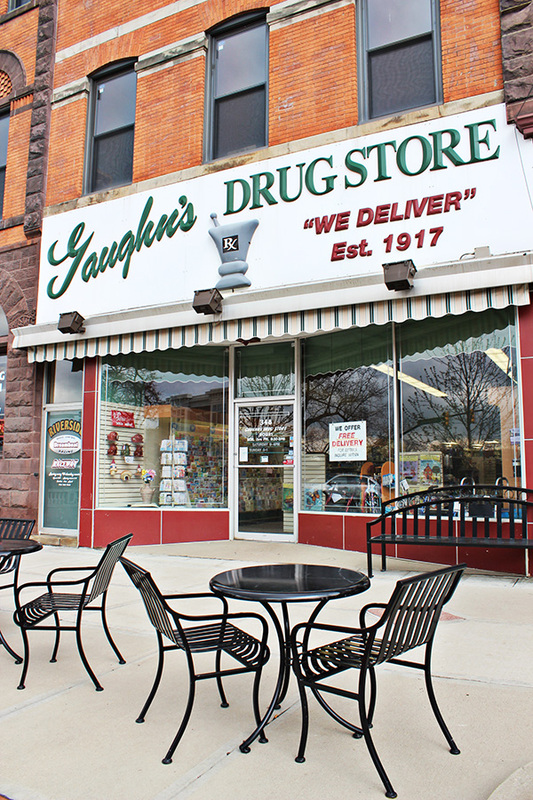 The history of Gaughn’s Drug Store dates back to 1917. After being in two different partnerships in the early 1900’s, the namesake of the business, Joseph Gaughn, began operating a pharmacy on his own in 1917. In 1922, the business was moved to the brick building at the corner of Pennsylvania Avenue West and Hickory Street, where it still operates from today. Since then the drug store has had four ownership changes. Melvin Ahlgren, Mr. Gaughn’s staff pharmacist, purchased the store in 1939. Mr. Ahlgren’s staff pharmacist, Irv Poust, purchased the business in 1958. Harold and Nancy Singleton took over ownership in 1980. In 2005, the Singletons sold the business to Robert Ruhlman, Scott Newton, and Judy Mullen. Bob and Scott worked for the Singletons as interns during their college days and as pharmacists later. Judy has been with the store for 39 years. In 2017, Scott Newton purchased Bob’s ownership and now currently owns the store in partnership with Judy. Many things have changed since Mr. Gaughn first opened the doors 101 years ago. Back then, pharmacists made most of the medications they dispensed by compounding them. A number of the old bottles that contained the liquids and powders used to make the medicines dispensed are still on display at the store. Today, almost all medications given to patients have been made by large pharmaceutical companies. The pharmacist’s typewriter has been replaced by computers and laser printers. Gaughn’s became the first retail pharmacy in the county to be computerized in 1979. The brick building where Gaughn’s has been located since 1922 has been in existence since the late 1800s. While certain aspects have changed over the years, the basic look of the building has remained the same. Inside, Gaughn’s has the look of an old-fashioned store. Many visitors to the store comment on its unique appearance. The original metal ceiling is even still in place. With “big box” stores and insurance-owned mail order pharmacy becoming commonplace in the country, Gaughn’s has done its part to keep the friendly, competitive independent pharmacy a viable part of the community.